Caroline Mast was most valuable player in the Ohio Class AA tournament when River View High School won the 1982 championship. She was a two-time All-American and three-time Mid-American Conference player of the year at Ohio University. Mast set Ohio University and MAC records by scoring 2,449 points and grabbing 1,223 rebounds. 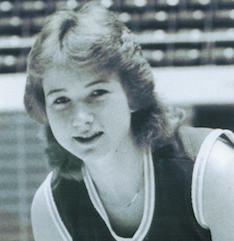 She led the Bobcats to the MAC title in 1986 and was most valuable player in the tournament. She averaged 23 points and 11.7 rebounds in MAC games and was voted MAC player of the decade for the 1980s. Caroline Mast Daugherty spent 25 years as River View’s head coach, winning back-to-back state championships in 2006 & 2007. In 2005-06, the Lady Bears won the Division II state title with a 26-1 record. After another trip to the state tournament in 2009, Daugherty retired. She finished her career with a 132-16 coaching record, including a 67-1 mark in East Central Ohio League play. She coached two of her daughters, Kristin and Kari while at River View.